Women make 70–85% of all consumer decisions. The women of the world will earn $18 trillion next year. Women also make most healthcare purchasing decisions (and make up 88% of the healthcare workforce). And countless studies prove that gender is the single most powerful lens through which we view the world — more so than race, income, age or other demographic variable. Yet women are underrepresented among researchers, entrepreneurs, executives, policy-makers, and VC's — despite driving most of the markets we serve. Silicon Valley, in particular, has seen the impact of that underrepresentation in gut-wrenching ways over the past few weeks. We know that more women at the VC table makes an incredible difference and are proud to lead by example, with an investment team that is 40% women, including at the General Partner level. 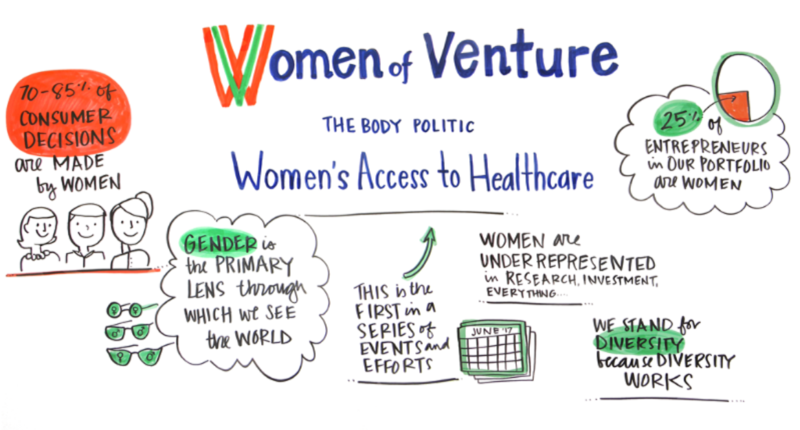 So, last week we kicked off Canaan's Women of Venture series called The Body Politic — discussions about topics that affect how women lead successful, satisfying and healthy lives — in work, at play, in their families and communities. The first installment covered how women currently access health services and insurance coverage, family planning and reproductive health services — and the potential impact of changes to the Affordable Care Act. An incredible lineup of leaders joined us for this inaugural event. Alina Salganicoff is the Vice President and Director of Women's Health Policy at the Kaiser Family Foundation, a non-profit organization focusing on national health issues, and is a member of the Institute of Medicine's Committee on Women's Health and for Preventive Services for Women. Yasmin Peled serves as the Northern California Organizer for Health Access California, a statewide healthcare consumer advocacy coalition for quality affordable healthcare for all Californians. Amy Moy is the Vice President of Public Affairs at Essential Access Health, an organization that champions and promotes quality sexual and reproductive health care for all and which serves as the administrator of California's Title X (ten) federal family planning program serving low-income and uninsured Californians. Gilda Gonzales is the CEO of Planned Parenthood Northern California — one of the largest Planned Parenthood affiliates in the country. At Canaan, we are committed to fostering conversation and community among entrepreneurs, venture capitalists and leaders who are passionate about women's issues. We look forward to tackling many more topics in the weeks and months ahead, including women and the workplace, career-life hacking, immigration, health and vitality. Stay tuned.